North Korea is located in East Asia on the Northern half of the Korean Peninsula. North Korea shares a border with three countries; China along the Amnok River, Russia along the Tumen River, and South Korea along the Korean Demilitarized Zone (DMZ). The Yellow Sea and the Korea Bay are off the west coast and the Sea of Japan (East Sea of Korea) is off the east coast. Most of North Korea is a series of medium-sized to large-sized Mountain Ranges and large hills, separated by deep, narrow valleys. The highest peak, Paektu-san on the volcanic Baekdu Mountain, is located on its northern border with China, and rises 9,002 ft. (2,744 m). Along the west coast there are wide coastal plains, while along the Sea of Japan coastline (North Korea's lowest point at 0 m), narrow plains rise into mountains. Similar to South Korea, dozens of small islands dot the western coastline. North Korea's longest river is the Yulu (Yalu). Other large rivers include the Tumen, Taedong and Imjin. The terrain consists mostly of hills and mountains separated by deep, narrow valleys. The coastal plains are wide in the west and discontinuous in the east. Early European visitors to Korea remarked that the country resembled "a sea in a heavy gale" because of the many successive mountain ranges that crisscross the peninsula. Some 80 percent of North Korea's land area is composed of mountains and uplands, with all of the peninsula's mountains with elevations of 2,000 metres (6,600 ft) or more located in North Korea. The great majority of the population lives in the plains and lowlands. Paektu Mountain, the highest point in North Korea at 2,743 m (9,003 ft), is a volcanic mountain near Manchuria with basalt lava plateau with elevations between 1,400 metres (4,600 ft) and 2,000 metres (6,600 ft) above sea level. The Hamgyong Range, located in the extreme northeastern part of the peninsula, has many high peaks, including Kwanmobong at approximately 2,541 metres (8,337 ft). 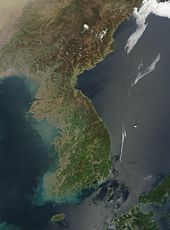 Other major ranges include the Rangrim Mountains, which are located in the north-central part of North Korea and run in a north-south direction, making communication between the eastern and western parts of the country rather difficult; and the Kangnam Range, which runs along the North Korea–China border. Geumgangsan, often written Mt Kumgang, or Diamond Mountain, (approximately 1,638 metres (5,374 ft)) in the Thaebaek Range, which extends into South Korea, is famous for its scenic beauty. For the most part, the plains are small. 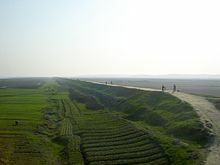 The most extensive are the Pyongyang and Chaeryŏng plains, each covering about 500 km2. Because the mountains on the east coast drop abruptly to the sea, the plains are even smaller there than on the west coast. The mountain ranges in the northern and eastern parts of North Korea form the watershed for most of its rivers, which run in a westerly direction and empty into the Yellow Sea and Korea Bay. The longest is the Amnok River, which is navigable for 678 km of its 790 kilometres (490 mi). The Tuman River, one of the few major rivers to flow into the Sea of Japan, is the second longest at 521 kilometres (324 mi) but is navigable for only 85 kilometres (53 mi) because of the mountainous topography. The third longest river, the Taedong River, flows through Pyongyang and is navigable for 245 of its 397 km. Lakes tend to be small because of the lack of glacial activity and the stability of the Earth's crust in the region. Unlike neighboring Japan or northern China, North Korea experiences few severe earthquakes. The country has a number of natural spas and hot springs, which number 124 according to one North Korean source. North Korea has a combination of a continental climate and an oceanic climate, with four distinct seasons. Most of North Korea is classified as being of a humid continental climate within the Köppen climate classification scheme, with warm summers and cold, dry winters. In summer, there is a short rainy season called changma. Long winters bring bitter cold and clear weather interspersed with snow storms as a result of northern and northwestern winds that blow from Siberia. The daily average high and low temperatures for Pyongyang in January are −3 and −13 °C (27 and 9 °F). On average, it snows thirty-seven days during the winter. Winter can be particularly harsh in the northern, mountainous regions. Summer tends to be short, hot, humid, and rainy because of the southern and southeastern monsoon winds that bring moist air from the Pacific Ocean. Spring and autumn are transitional seasons marked by mild temperatures and variable winds and bring the most pleasant weather. The daily average high and low temperatures for Pyongyang in August are 29 and 20 °C (84 and 68 °F). On average, approximately 60% of all precipitation occurs from June to September. Natural hazards include late spring droughts which are often followed by severe flooding. Typhoons affect the peninsula on an average of at least once every summer or early autumn. The drought that started in June 2015, according to the Korean Central News Agency, has been the worst seen in 100 years. The environment of North Korea is diverse, encompassing alpine, forest, farmland, freshwater, and marine ecosystems. In recent years, the environment has been reported to be in a state of "crisis", "catastrophe", or "collapse". Cultivation, logging, and natural disasters have all put pressure on North Korea's forests. During the economic crisis of the 1990s, deforestation accelerated, as people turned to the woodlands to provide firewood and food. This in turn has led to soil erosion, soil depletion, and increased risk of flooding. In response, the government has promoted a tree planting program. Based on satellite imagery, it has been estimated that 40 percent of forest cover has been lost since 1985. North Korea has an area of 120,538 km², of which 120,408 km² is land and 130 km² is water. It has 1,671.5 kilometres (1,038.6 mi) of land boundaries; of these, 1,416 kilometres (880 mi) are with China, 238 kilometres (148 mi) are with South Korea, and 17.5 kilometres (10.9 mi) are with Russia. The Korean Peninsula extends about 1,000 kilometres (620 mi) southward from the northeast Asian continental landmass. The 8,460 kilometres (5,260 mi) coastline of Korea is highly irregular, and North Korea accounts for 2,495 kilometres (1,550 mi) of this, roughly one-third. Some 3579 islands lie adjacent to the Korean Peninsula, mostly along the south and west coasts. The southern stretch of its east coast forms the northern side of the East Korea Bay. At the headland Musu Dan, this ends and the coast turns sharply northward. The North Korean government claims territorial waters extending 12 nautical miles (22.2 km; 13.8 mi) from shore. It also claims an exclusive economic zone 200 nautical miles (370.4 km; 230.2 mi) from shore. In addition, a maritime military boundary that lies 50 nautical miles (92.6 km; 57.5 mi) offshore in the Sea of Japan (East Sea of Korea) and 200 nautical miles (370.4 km; 230.2 mi) offshore in the Yellow Sea demarcates the waters and airspace into which foreign ships and planes are prohibited from entering without permission. Waters of the Yellow Sea are demarcated between North Korea and South Korea by the disputed Northern Limit Line drawn by the United Nations Command (Korea) in early 1950s and not officially recognized by North Korea. Disputes between North and South Korean naval vessels have occurred in this area. A total of five disputes were noteworthy enough to have been reported in the news (three in 2009 and two in 2010). Natural resources include coal, petroleum, lead, tungsten, zinc, graphite, magnesite, iron ore, copper, gold, pyrites, salt, fluorspar and hydropower. ^ "Topography and Drainage". countrystudies.us. U.S. Library of Congress. Retrieved 17 June 2018. ^ a b c d "North Korea Country Studies. Climate". Lcweb2.loc.gov. Archived from the original on 12 December 2012. Retrieved 23 June 2010. ^ Federal Research Division of the US Library of Congress (2007). "North Korea – Climate". Country Studies. Archived from the original on 27 September 2006. Retrieved 1 August 2007. ^ "North Korea says it faces worst drought in a century". BBC. 17 June 2015. Archived from the original on 18 June 2015. Retrieved 19 June 2015. ^ a b Tenenbaum, David J. (2005). "International Health: North Korean Catastrophe". Environ Health Perspect. 113 (1): A26. doi:10.1289/ehp.113-a26. PMC 1253723. PMID 15643724. ^ a b McKenna, Phil (March 6, 2013). "Inside North Korea's Environmental Collapse". PBS. Archived from the original on December 23, 2014. ^ a b Kirby, Alex (August 27, 2004). "North Korea's environment crisis". BBC. Archived from the original on February 21, 2006. ^ "The Environment Is So Bad in North Korea, They'll Even Let Americans Help". The Atlantic Wire. April 3, 2012. Archived from the original on June 6, 2013. ^ Raven, Peter (2013-09-09). "Engaging North Korea through Biodiversity Protection". Science & Diplomacy. 2 (3). Archived from the original on 2013-10-29. ^ Prescott & Schofield 2001, p. 25. Prescott, John Robert Victor; Schofield, Clive H. (2001). Furness, Shelagh (ed.). "Undelimited Maritime Boundaries of the Asian Rim in the Pacific Ocean". Maritime Briefing. Durham: International Boundaries Research Unit, University of Durham. 3 (1). ISBN 978-1-897643-43-3. 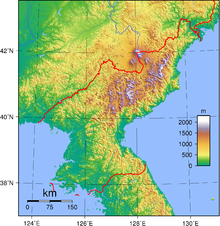 Wikimedia Commons has media related to Geography of North Korea.